Agave nectar (also known as agave syrup) comes from the same cactus as tequila comes from. In some ways it is similar to honey and can usually be used in the same way in recipes, although it is sweeter than honey so the quantity should be reduced. It can also be used to sweeten drinks, or in place of syrup on things like pancakes and waffles. I hadn’t used it before, and once again, the effervescent Gabriela Blandy stepped up and provided a recipe for me. Thank you Gabriela! This is a black banana bread which uses agave nectar as its sweetening ingredient. It’s really yummy and I highly recommend making it – if you decide that you don’t want to use agave nectar, you could substitute another sweetener such as honey or maple syrup. 150g dried fruit mix (Gabriela recommends a mix from Tesco which contains raisins, cranberries, strawberries and cherries – that’s what I used, and I recommend it too! If you don’t have a Tesco near you though, you’ll have to improvise). 1) Pre-heat oven to 170C/340F. 2) Beat butter and agave nectar, then add the eggs and combine. 3) Fold in the flour until well combined. 4) Peel and mash the bananas well. Add them to the mixture along with the vanilla and dried fruit. Turn gently with a metal spoon until combined, but don’t over-mix. 5) Pour into two lined 20cm x 12cm loaf tins (Gabriela finds that just a strip down the center works if the tins are buttered. I used a silicone loaf tin, so I didn’t need to line or grease it at all). 6) Put batter into tins and bake for between 1 hour and 1 hour 15 until a cocktail stick inserted into the centre comes out clean. If the top starts to darken too quickly during cooking, put a piece of foil on the top. Hey! Who finished it up? Well I did say it was yummy. If you make it, you’ll probably find it won’t last long in your house either, although supposedly it will keep in a tin for a week. 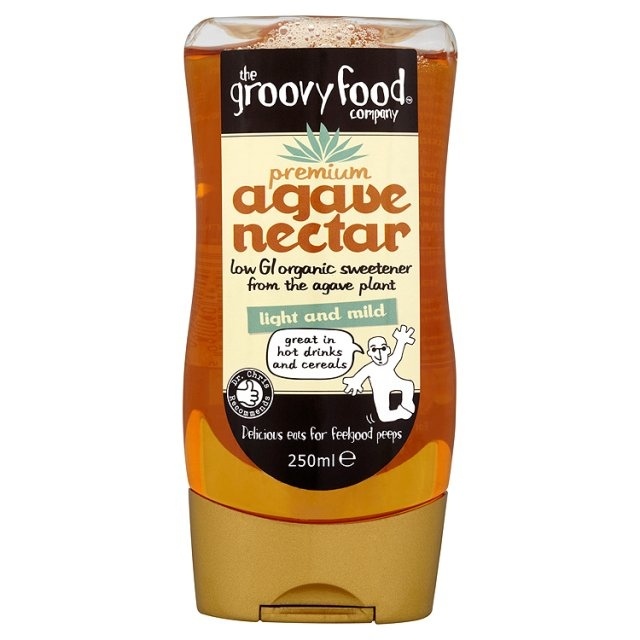 Do you ever use agave nectar? (mumble, mumble, mumble, quickly wipes chin) …… oh hi Vanessa …. where’s the black banana bread, you say? …. er, no idea … byee …. Ha! Yes, there was a problem with the photo I was going to use of the final loaf, so Gabriela came up with the idea of using an empty plate with crumbs on it instead. She’s a genius! It really is that good though, I’m definitely making it again. I never realised there was so much controversy and heated debate over some of these sugar alternatives. It’s interesting finding out about them. I’m mostly pleased about getting this recipe from Gabriela though. I might try making it with maple syrup another time, I think that would taste really good too. I know what you mean, and really if you listened to every food controversy you’d never eat anything! I’m a proponent of moderation too, and variety. I figure with lots of variety you hopefully won’t miss out on things you should be eating, and won’t overdo the things you shouldn’t!